Possible benchmarks for the iPhone 7 Plus have materialized, potentially confirming rumors about the device shipping with 3GB of application RAM, as well as dramatically improved performance over the iPhone 6s Plus. An "iPhone 9,4" was discovered in the GeekBench database on Thursday running the Golden Master version of iOS, version 10.0.1. The low-power high-efficiency processors heralded by Apple at the "See You on Sept. 7" event don't appear to be included by name in the testing, with the processor listed as an ARM dual-core device, running at 2.23 GHz. The "iPhone 9,4" posts a single-core aggregate benchmark of 3233, as compared to the iPhone 6s Plus pulling down a 2508. 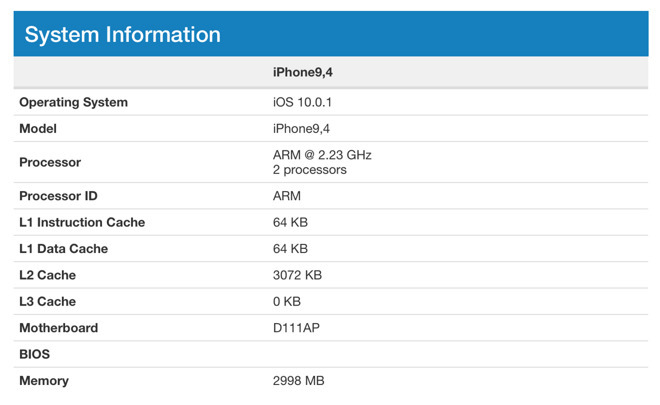 Multi-core performance on the new device is listed as 5363, with the 6s Plus coming in at 4106. While the benchmark for the device appears legit, the authenticity of the single test cannot be verified at this time. Other Apple devices have been benchmarked using GeekBench 4 as well. The iPad Air 2 with a three-core A8X processor benchmarks at 1732 for single-core, and 2697 for multi-core. The third-generation iPad with a dual-core A5X processor is only 327 for single-core, and peaks at 562 for multi-core performance. The 12.9-inch iPad pro with A9X processor hits 3010 for single-core performance, and 4910 on multiple core tests. The iMac 17,1, also known as the late 2015 Retina iMac 5K with 27-inch screen and i7 processor running at 4GHz has a single-core performance of 5199. The same iMac's multiple core performance is measured at 16722.